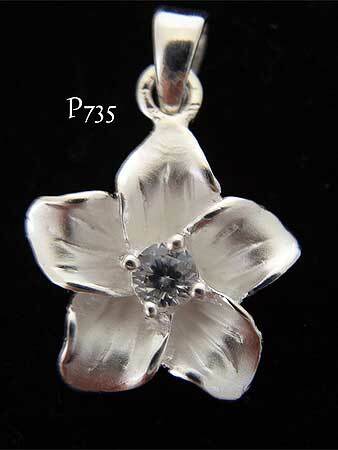 Sterling silver Hawaiian Plumeria (frangipani) pendant with a light frosted finish and hand carved flower markings. Central eye of sparkling clear cubic zirconia. A beautiful piece of Hawaiian jewelry. Measurements: Flower diameter 10mm. Also available in sizes 21mm, 25mm and 33mm diameter.